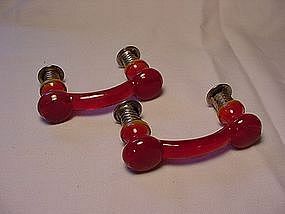 These red glass drawer handles date to the late 1920's - 30's and are authentic depression era glass. They are NOT the reproduction junk being sold today. Excellent condition, each handle includes the original hardware mountings. Red handles are rare indeed so grab these while you can! I have 4 available, price is per handle. See my other listings for more glass handles also from the depression era.